15 5/8 x 14 1/2 x 10 3/4 in. 50 x 42 x 34 in. 34 x 34 x 21 in. 29 x 16 1/2 x 14 in. James Cohan is pleased to present an exhibition of works by Nahum Tevet, Richard Long, and Alan Saret. 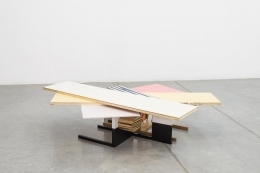 The works in the exhibition are united by their physicality and adept spatial integration. Known primarily for their sculptures, these artists appropriate the floors and walls of the gallery as compositional elements. 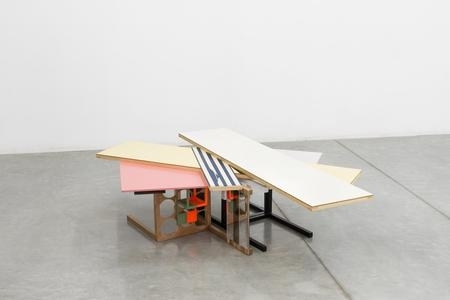 The interplay between the sculptures and exhibition space creates new tensions and changes the viewer’s experience of both the art and architecture by obstructing pathways and emphasizing the artists’ unexpected materials. The exhibition will be on view at the gallery’s Lower East Side location from June 9 through July 28, 2017 with an opening reception on Friday, June 9 from 6-8 PM. Nahum Tevet (b. 1947, Kibbutz Mesilot, Israel) builds complex, planar sculptures from wooden boards, sheets of metal and glass. The variation of Tevet’s materials and textures emphasize the geometric dissonance that is a foundational aspect of his aesthetic. Tevet came of age in the late 1960s under the influence of Minimalism and emerging post-Minimalisms, yet his work is conversant with the legacy of Constructivism and modernist European architecture. His compositions blur the division between inner and outer space, complicating the boundaries and sanctity of the artwork. 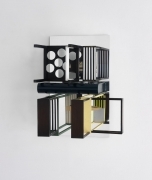 Tevet’s constructions are displayed either directly on the floor or mounted on the wall. 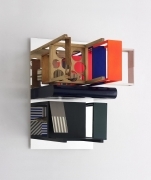 For Tevet, the architectural planes of the gallery are not only a useful conveyance for the artwork, but also act as compositional elements seamlessly integrated into the visual logic of the sculptures themselves. The intricacies of the sculptures and intentional confusion of sightlines produce disorientation, impeding attempts to assimilate the works into easily digestible statements. 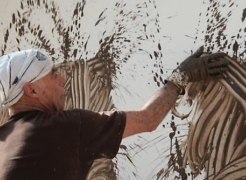 Richard Long (b. 1945 Bristol, England) is celebrated for his landscape interventions and for the introduction of unorthodox, natural materials into his paintings and sculptures. 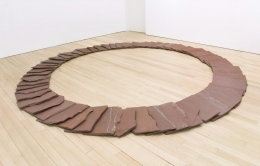 Long’s sculptures, such as Red Ring (2017), are geometric, low-lying, and composed of carefully chosen stones. These sculptures harness the power of ritual, transforming the natural world into portable monument and charging the exhibition space with their unexpected presence. Using a similar strategy in two dimensions, Long painted two canvases on view in this exhibition with mud from the River Avon, which runs through Long’s native Bristol. These compositions reflect the flow and stasis of the river. Long elides the barrier between nature and art, revealing in both analogous expressions of non-utilitarian beauty. Alan Saret (b. 1944, New York, NY) came to prominence during a period of radical sculptural production in the 1960s and ‘70s. Saret’s sculptures are a reaction against the hard-edged geometries of his Minimalist predecessors, instead reveling in their malleable contours and unrefined materials. The amorphous “anti-form” shapes of the works produces an illusion of constant expansion and contraction. Saret’s drawings executed in colored pencil are expressions of the same unpredictable yet restrained energy which characterizes his sculptures.